Children often show great interest in learning to read. 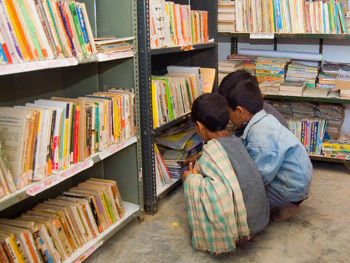 This photo is of a group of Indian schoolboys in a library. This article is about the process. For other uses of the term Reading, please see Reading (disambiguation). Reading is an active process of understanding and gaining knowledge from written text. A text may comprise written language in the form of an alphabet or other writing system, such as Braille. Other types of reading may not be text-based, such as music notation or pictograms. By analogy, in computer science, reading is the acquisition of data from some sort of computer storage. Reading is a means of acquiring language, of communication, and of sharing information and ideas. Effective reading involves the use of prior knowledge (schemata theory) and decoding skills (using morphemic, semantic, and syntactic cues). Although reading is now an important primary way for many people to receive information - such as on the Internet - this has been the case only for the last 150 years or so. With some exceptions, such as colonial America, only a small percentage of the population in any country was literate before the Industrial Revolution. Rates of reading include reading for memorization (under 100 words per minute or wpm), reading for learning (100-200 wpm), reading for comprehension (200-400 wpm), and skim reading (400-700 wpm). Reading for comprehension is the essence of most people's daily reading. Skimming is sometimes useful for processing larger quantities of text superficially at a much lower level of comprehension (below 50%). Advice for the appropriate choice of reading rate includes reading flexibly, slowing down when the concepts are closely related or when the material is unfamiliar, and speeding up when the material is familiar and the material is not complicated. Speed reading courses and books often encourage the reader to continually speed up; comprehension tests lead the reader to believe that their comprehension is constantly improving. However, competence in reading involves multiple approaches to the text, from skim reading to close reading, in order to gain understanding. Subvocalized reading combines sight reading with internal sounding of the words as if spoken. It can slow reading and comprehension, if applied to all reading material, but can also be essential for reading text like poetry or transcripts of oral speeches, which involve the rhythm of spoken language. Speed reading is a collection of methods for increasing reading speed without an unacceptable reduction in comprehension or retention, closely connected to speed learning. Proofreading is a kind of reading for the purpose of detecting typographical errors. One can learn to do it rapidly, and professional proofreaders typically acquire the ability to do so at high rates, faster for some kinds of material than for others. They may largely suspend comprehension while doing so, except when this is needed to select among several possible words that a suspected typographic error allows. The Structure-Proposition-Evaluation (SPE) method, popularised by Mortimer Adler in How to Read a Book and mainly for non-fiction treatises, is one in which reading proceeds in three passes: once for the structure of the work, which might be represented by an outline; again for the logical propositions made, organized into chains of inference; and finally for evaluation of the merits of the arguments and conclusions. This method involves suspended judgement of the work or its arguments until they are fully understood. The Survey-Question-Read-Recite-Review (SQ3R) method, often taught in public schools, involves reading towards being able to teach what is read, and would be appropriate for instructors preparing to teach material without having to refer to notes during a lecture. The Multiple Intelligences-based methods, which draw upon the reader's diverse ways of thinking and knowing to enrich his or her appreciation of the text. Reading is fundamentally a linguistic activity; one can basically comprehend a text without resorting to other intelligences, such as visual (e.g. mentally 'seeing' characters or events described), auditory (e.g. reading aloud or mentally 'hearing' sounds described), or even logical intelligence (e.g., considering 'what if' scenarios or predicting how the text will unfold based on contextual clues). Most readers use several intelligences while reading. Phonics involves teaching reading by associating letter (alphabet)s or groups of letters with distinctive 'sounds', i.e. phonemes. This is sometimes argued to be in competition with whole language methods. Whole language methods involve acquiring words or phrases without attention to the letters or groups of letters that compose them. Critics sometimes argue that the whole language approach tends to impair learning how to spell; others such as Stephen Krashen argue that more comprehension and enjoyment result when meaning is the primary reason to read. For most children in the United States, formal training to read begins in kindergarten (approximately age 5), and most children have learned to read by the age of 6 or 7. The issue of when a child is "ready" to be taught to read goes under the name reading readiness, and there is some debate among educational psychologists about when this is. Generally, when children have displayed certain signs, such as taking an interest in words, knowing his or her name, and knowing the alphabet, they might be considered ready to learn to read. Many reading experts believe that aggressive attempts to teach children to read before they are ready will in too many cases lead to frustration and, as a result, bad associations with reading. They also dismiss very early reading programs as only teaching children to "bark at print"--that is, merely memorize the association of the shape of the word with the sound of the word, without getting meaning. Nevertheless, there are cases of infants under one year of age can memorize the connection between the shape of words and objects, but it is not until some time after that they are capable of decoding words or "making sense" of entire sentences. There have been two- and three-year-olds who are capable of reading "first reader" type books on their own and with some comprehension; see accelerated early childhood education. It is much more widely agreed that, to get small children ready to read, it is important that they be read to, even from infancy. This teaches familiarity with words and their sounds (or phonemes) and with books and how to hold them, as well as teaching some vocabulary and comprehension that are necessary to getting meaning later. After his mother's divorce from Mr. Persons and her marriage to Joe Capote, she brought her son to live with them in New York. He was sent to several private schools, including Trinity School and St. John's Academy in New York, but he disliked schools and did poorly in his courses, including English, although he had taught himself to read and write when he was 5 years old. Having been told by many teachers that the precocious child was probably mentally backward, the Capotes sent him to a psychiatrist who, Truman Capote said triumphantly some years later, "naturally classified me as a genius." In Gerald Clarke's Capote: A Biography (1988), one paragraph describes how Capote was usually seen at age five carrying his dictionary and notepad. Conversations with Truman Capote has a passage telling how Capote taught himself to read (in a town with no library) by collecting old farm magazines and each day at 6 p.m. meeting the bus which dropped off the two newspapers from Mobile and Montgomery. Another example is Hadley Bond, a gifted child in Australia who taught himself to read by the age of one-and-a-half, had a library at age two and taught himself maths at the age of three. There are numerous accounts of people who taught themselves to read by comparing street signs or Biblical passages to speech, plus many mentions of Abraham Lincoln teaching himself. The novelist Nicholas Delbanco taught himself to read at six by studying a book about boats during a transatlantic crossing. Reading achievement is influenced by multiple factors, and is not limited to a child's Intelligence quotient. Sight word reading: reading words of increasing difficulty until the subject becomes unable to read or understand the words presented. Difficulty is manipulated by using words that have more letters or syllables, are less common and have more complicated spelling-sound relationships. Reading comprehension: a passage is presented to the reader, to read either silently or out loud. Then a series of questions are presented that test the reader's comprehension of the passage. Reading fluency: the rate at which individuals can name words. Some tests incorporate several of the above components at once. For instance, the Nelson-Denny reading test scores readers both on the speed at which they can read a passage, and also their ability to accurately answer questions about it. Studies have shown that American children who learn to read by the third grade (8-9 years) are less likely to end up in prison, drop out of school, or take drugs. Adults who read literature on a regular basis are nearly three times as likely to attend a performing arts event, almost four times as likely to visit an art museum, more than two-and-a-half times as likely to do volunteer or charity work, and over one-and-a-half times as likely to participate in sporting activities. Literacy rates in the USA are also more highly correlated to weekly earnings than IQ. Reading books is generally regarded as being a relaxing pastime, while at the same time stimulating the brain to process text. Reading requires more lighting than many other activities, so the possibility of comfortable reading in cafés, restaurants, buses, in parks and so on greatly varies depending on available lighting and time of day. In the 1950s, many offices and classrooms were over-illuminated, but since about 1990, there has been a movement to create reading environments with appropriate lighting levels (approximately 600 to 800 lux). ↑ This is also possible for syllabaries, where symbols indicate syllables rather than individual phonemes. ↑ This can be seen in the "Your Baby Can Read" videos by Robert Titzer (ISBN B000EGD4US). ↑ According to Jamie Littlefield. ↑ See this graph illustrating the relationship. This page was last modified 04:19, 26 October 2013.